This week’s new Blu-ray releases are chock-full of new movies on disc, as well as some cult classics, 80’s films, and even a couple titles dating before color film was used for motion pictures. And, there are few movies you might check out that are getting an early digital release. On top of the most popular new titles this week is Sony Pictures’ Jumanji: Welcome to the Jungle available in both Blu-ray and 4k Blu-ray combo editions with two discs and a digital copy. Best Buy also has exclusive SteelBook editions of each format with cover artwork that’s different from the common disc editions. Pitch Perfect 3 is now available on Blu-ray and 4k Blu-ray, and along with the release of the third film in the franchise comes 4k Blu-ray editions of Pitch Perfect and Pitch Perfect 2. Best Buy and Target each have their own exclusive editions of Pitch Perfect 3, available in SteelBook and Only @ Target versions, respectively. 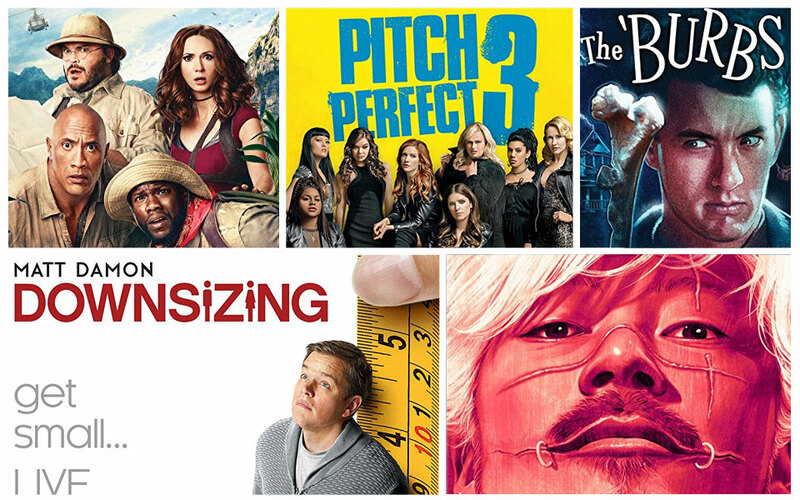 And, Downsizing is yet another popular title from last year now on Blu-ray Disc and digital. Downsizing comes in both Blu-ray and Ultra HD Blu-ray editions with a second disc and digital copy, as well as six behind-the-scenes featurettes. On digital this week, The Greatest Showman, Father Figures, and Insidious: The Last Key are among new movies released early to digital in advance of disc and on-demand. Here’s a look at this week’s new Blu-ray and digital releases. Be sure to also check out new 4k Blu-ray releases! Be sure to check out last week’s new Blu-ray releases if you missed it.